Heating, ventilation, and air conditioning (HVAC) account for 13% of energy consumed in the United States. That energy is used to control the comfort of the entire space, which is a much larger area than the thermal environment around each individual in the building. Passive, thermally adaptive clothing that changes insulation in response to the local temperature has the potential to broaden the range of comfortable temperatures for building occupants. ARPA-E estimates that relaxing building temperature set point requirements from 70°F for heating and 75°F for cooling to 66°F and 79°F, respectively, will reduce annual HVAC energy consumption by 15%. For a typical building occupant to remain comfortable over this widened range of temperatures—both warmer and cooler than typical workplace conditions—clothing would need to nearly double its insulation value in response to an ambient temperature change of 13°F, or about 7ºC. Although 13°F is large with respect to human comfort, in physical terms, this is a large insulation change in response to a small difference in temperature, and therefore, requires the invention of a textile with unique behavior. At the same time, the textile should also remain familiar enough to be accepted by consumers. Textile production technologies are highly developed, but recent advances in computer-controlled production and low-cost sensing enable precision yarn and fabric prototyping at a much faster rate than ever before. These advances accelerate fabric R&D and reduce the time required for design iteration. 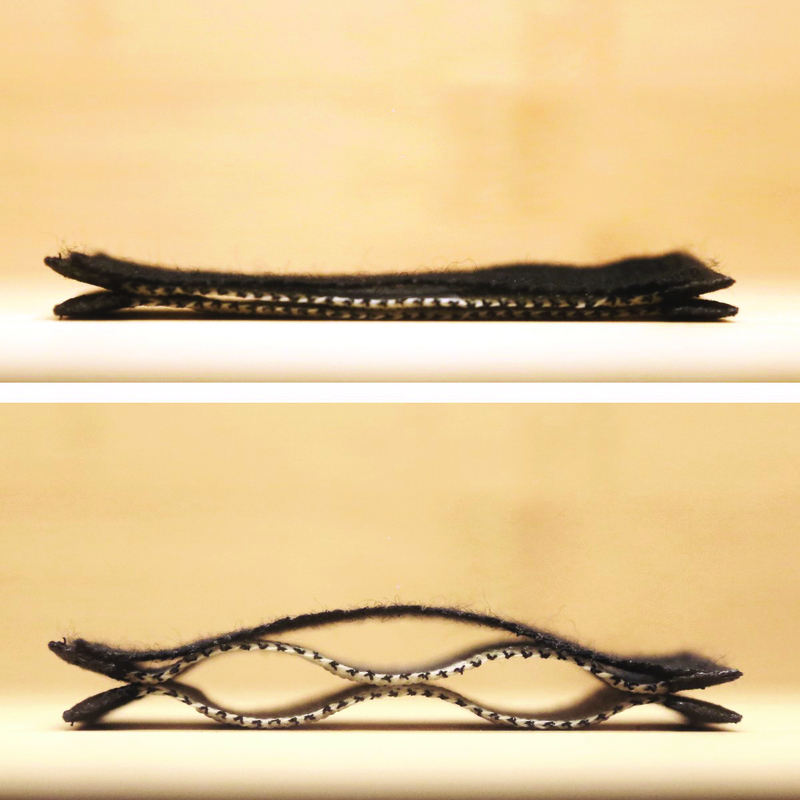 Additionally, coupling advanced production techniques with standard materials creates an opportunity for thermally responsive textiles with a low barrier to adoption. Figure 1: Thermally responsive textile at room temperature (top, textile is flat) and at a cold temperature (bottom, textile is lofted). The first phase of work focused on the demonstration of a textile that passively doubled its insulation value in response to a change in ambient temperature from 81ºF to 63ºF (27ºC to 17ºC), an expanded temperature range slightly larger than specified in ARPA-E’s program goals. The textile’s adaptive structure intentionally pairs mismatched materials with advanced fabrication processes, where one material responds much more strongly to a temperature change than its complement. Temperature changes cause the textile to go from a flat, thin textile, to a slightly wavy textile that traps air in the small pockets that form between layers, where the trapped air increases the effective insulation value. The textile requires no external power and responds to temperature through a natural material response. These results were achieved with commodity polymers that are commonly used in the industry. For this concept, utilization of commodity polymers is critical for the production of a cost-effective adaptive garment. To realize the large change in insulation, Otherlab made a number of yarn and fabric iterations, and precision control of yarn and fabric production made the rapid iterations possible. The first phase of work demonstrated that a textile can achieve the targeted temperature-triggered change in insulation. As such, ARPA-E has awarded Otherlab additional funding for a second phase of development, during which the project will demonstrate paths to production and to market. In this phase, Otherlab will identify potential commercialization partners and demonstrate reliable yarn and fabric production at a level adequate for sampling to these partners. Further, Otherlab will optimize the fabric, including fine-tuning practical characteristics such as feel, breathability, and washability, and complementing the thermal response of the fabric. Simultaneous product planning, go-to market sourcing, and partnering will inform and support the ultimate project deliverable—a thermally adaptive garment providing comfort from 66-79ºF (19-26ºC). Based on the lab-scale success demonstrated in this project and following the award of the second phase, this work has attracted private investment to establish a spin-out company to commercialize the technology. The apparel, outdoor, and home textiles business sectors all have commercial interest in thermally adaptive textiles. The temperature-sensitive materials under development do not have an analog or direct competitor in the market. These materials compete with conventional, non-responsive, incumbent materials that have gained wide acceptance and have generally reached technological maturity and production scale. While there is a clear performance advantage—improved thermal comfort over a wider range of ambient temperatures—there are a number of practical barriers, including production reliability and performance characteristics, that are being addressed through additional research in the second phase of this project. Upcoming ARPA-E milestones will systemically address development goals related to the practical considerations of moving this research to market. In the final stages of the ARPA-E project, the project is expected to advance to material sampling and identify go-to-market partners who can assist with practical, real-world prototype testing and with forming domestic mill production agreements. The team’s temperature-sensitive textile is the first known to demonstrate such a large change in insulation. If widely adopted, the thermal properties of these adaptive garments would enable a savings of 2% of domestic energy and associated greenhouse gases. Upcoming ARPA-E project milestones will address technical barriers to widespread adoption. The doubling of insulation over a relatively small temperature change is unique and offers a dramatic improvement in thermal performance that might make widespread adoption conceivable. The doubling of insulation value also means that a single garment might take on the role of two garments, leading to cost savings for the consumer in addition to energy savings. Otherlab has also made conscious efforts to use conventional materials throughout and to consider product lifecycle and recyclability. As of December, 2017, the Otherlab team’s project has generated four invention disclosures to ARPA-E, and one U.S. Patent and Trademark Office (PTO) patent application has been filed on the disclosed inventions.